Published below is the latest live information confirmed from stringers and sources in Papua regarding todays’s mobilisations. Live tweets are in Indonesian, but you can use auto-translation via twitter, just click on the embed. YOU CAN HELP US TO PAY FOR MORE ADVANCED SERVER COSTS ($900 PER YEAR) BY URGENTLY VISITING WESTPAPUAMEDIA.INFO/DONATE AND GIVING GENEROUSLY. While in Merauke, 14 activists have already taken to Polres Merauke. 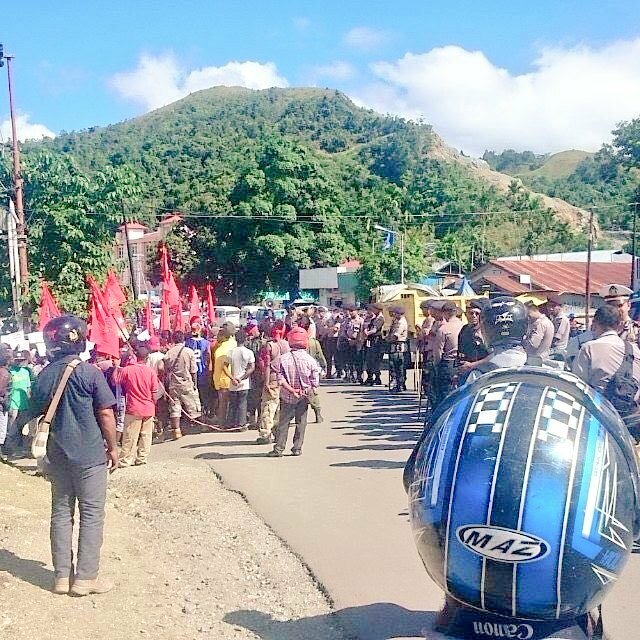 Jayapura 1115AM: First reports of attempts by security forces to shut down gathering in Waena, Jaypura. Police have moved in at the traffic lights, reportedly pushing with riot shields, seizing 5 trucks belonging to KNPB. Crowd currently is maintaining peaceful disposition. Jayapura: 1048AM Hundreds of people are already on site at Expo Waena listening to speeches on street attempting to march to Taman Imbi. Heavily armed security forces and many plain clothes intelligence officers already waiting.